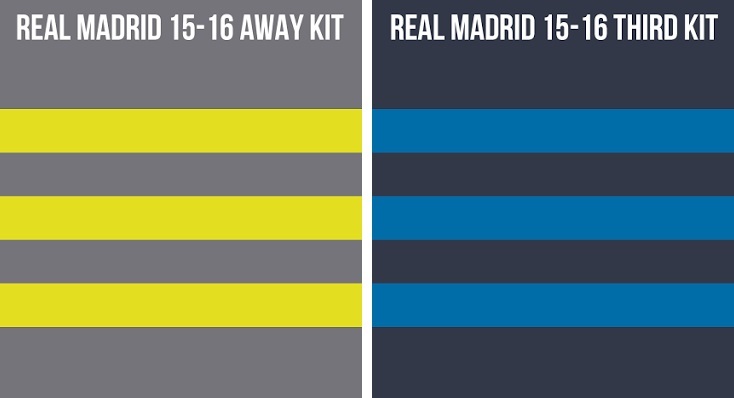 Real Madrid’s new adidas home and away kits are officially released by Adidas while the third kits ha been leaked and there is not much of a surprise in all the kit designs. The home kit is traditional white with grey application while the away kit is grey with yellow/dark grey application. The third kit which will be used in european away games next season is navy blue with light blue application. This is the new home kit for Real Madrid for 2015-16 season. This is the new Real Madrid 2015-16 home kit which comes in simple white colour and grey application on the shoulders with adidas stripes. The shorts of the home kit will be matching white with the shirt. Because the grey colour is very dim, it looks like an all white real madrid kit which will also feature faded grey adidas logo and white shorts and socks. 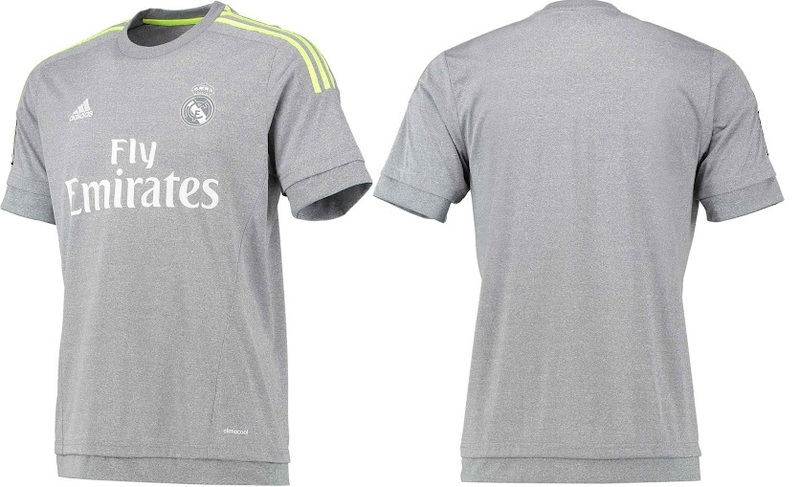 This is the new Real Madrid away kit for 2015-16 season, comes in unique grey/yellow/white design. The new real Madrid away kit will feature a grey and yellow color pattern, there will be three adidas stripes on the shoulders in colour yellow while the club badge and adidas logo will come in monochromatic style and a small round shape collar. The third kit for 2015-16 season will feature navy blue colour with light blue application. The away kit feature grey colour with yellow adidas stripes and application across the shirt while the third (alternative) kit will have Navy Blue colour and the application will be of lighter blue colour. Release Dates: The new kits for 2015-16 season will be releaded somewhere during the next pre season while while the away and third kits should be officially unveiled before the start of next season.